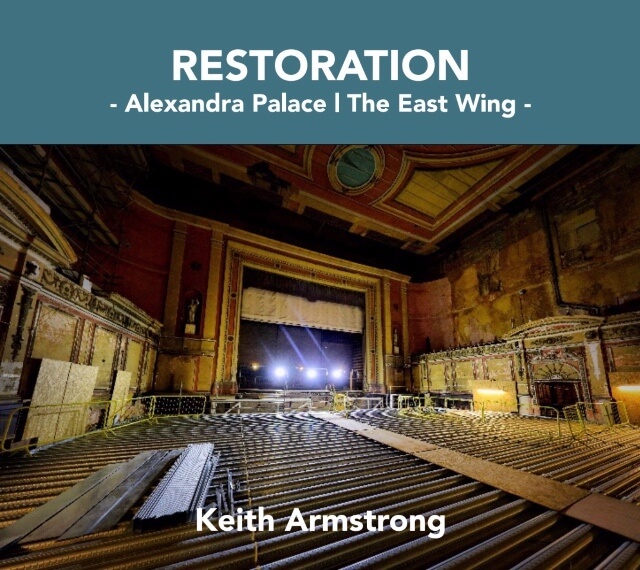 To coincide with the reopening of the Alexandra Palace Theatre, Keith Armstrong’s book Restoration : Alexandra Palace The East Wing is published on Monday 3rd December. “The book is a photographic record of a journey that began as a single entry in a competition to what became the detailed photographic record of the restoration. “Presented as a month-by-month time line, drawing on some 400 of the 6,000 images taken – all fully edited to bring out the detail and atmosphere of the site – and complemented by monthly progress notes and perspectives from both The Charitable Trust and the project team. “Find out what impact the restoration technique of ‘arrested decay’ had on the final look of The East Wing. “Discover how this photographic record becomes even more important in understanding the work that took place and the care and attention The Charitable Trust, the architects and the project team, took in retaining the integrity of a historically significant and locally much-loved landmark.